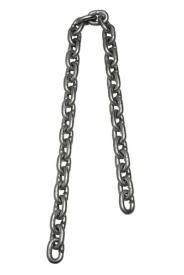 Grade P chain is manufactured from higher tensile steel (hardened and tempered) and provides twice the Working Load Limit (W.L.L) of Grade L. This chain conforms to AS2321-1979.The Working Load Limit (W.L.L) for Grade L chain is the maximum mass which the chain hanging vertically shall support in general service. For general conditions of use to group classification of crane mechanisms of M3 as specified in AS1418.1 the permissible Safe Working Load is the same as the Working Load Limit. For other than general conditions of use the SWL shall be elevated to conform to the group classification of crane mechanisms as specified in AS1418.1 for the conditions of use that apply.